Baraga Broadcasting, Inc. and Blarney Stone Broadcasting, Inc. have entered into a purchase agreement that will enable Baraga Radio to significantly increase reach and coverage in northern Michigan. Blarney Stone Broadcasting, Inc. has agreed to sell WSRT (106.7 FM) licensed to Gaylord, to Baraga Broadcasting, Inc., a non-profit 501(c)(3) listener-funded Catholic ministry dedicated to serving the people of the Diocese of Gaylord and the Diocese of Marquette. The addition of 106.7 FM to the Baraga Radio Network, makes it only the seventh 100,000-watt station providing Catholic radio programming in existence. Traverse City-Petoskey-Cadillac is the 160th largest radio market in the country with a Metro 12+ population of 297,300, according to Nielsen Media Research. The region is a destination to more than one million visitors each year. Founded in 2006, Baraga Radio has grown into a network of six stations, WTCK (90.9 FM) Charlevoix, WTCY (88.3 FM) Traverse City, WGJU (91.3 FM) East Tawas, WGZR (88.9 FM) Alpena, WIDG (940 AM) St. Ignace and WMQU (1230 AM) Grayling. On November 1, Baraga Radio will begin broadcasting on 106.7 FM through an LMA agreement, pending the approval by the FCC of the sale and transfer of the license. Programming features shows from EWTN and Ave Maria Radio, and recently Baraga began producing two of their own local programs, “The Cross Walk” and “Called to Freedom” with plans for more local shows to come. “Baraga Broadcasting will celebrate our 10th anniversary this November,“ Hornacek added. “As The Catholic Light of Northern Michigan, we strive to bring hope, peace and joy to a troubled world through the light of Christ. The purchase of this station is going to help us reach areas that have never had access to Catholic radio before. To have it take place at this special time in our history – well, it’s quite a blessing,” he concluded. 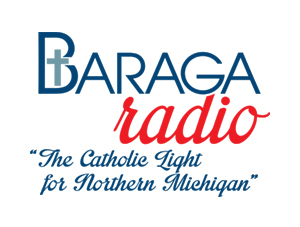 Baraga Broadcasting proclaims the truth and beauty of the Roman Catholic faith by offering educational and inspirational programming that aims to engage its listeners and encourage them to live out their faith in Jesus Christ.